Leary didn’t say this, but it strikes me the Army today has far more ways to kill tanks than to kill aircraft. Converting one Bradley in every four-vehicle platoon would trade a tolerable 25 percent decrease in anti-tank missiles for a new and much needed capacity for air defense – without affecting the number of infantry or scouts. 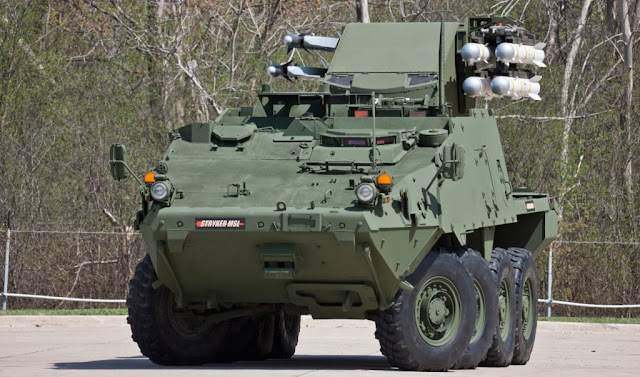 Stryker units and light infantry would still need to spring for dedicated air defense vehicles, but the heavy brigades crucial to any major war would not. US armor bristling with air defense might just make the Kremlin reconsider in a crisis. If you want to know why we're gonna lose the next war, add Russia phobia to the list of causes! I don't know why defense writers, politicians and even military leadership is so focused on Russia when it's OBVIOUS that China is the REAL threat! Back on task. The setup you see on the Stryker above is a re-imagining of the Avenger turret. They've updated it to fire both sidewinder and hellfire missiles. The multi-missile concept is alive and well. I'd love to see the Marine Corps jump on that bandwagon. A purpose built multi-missile rig along the lines of the HIMARS but with sidewinders, SPIKE LR (or another looong range anti-tank missile), 2.75 laser guided rockets quad packed inside a couple of pods, LRASM and a few standard rockets to boot? We could build our artillery battalions into a hybrid force with an air defense and anti-ship capability built in!